It was this time of year, several years ago (thank God), the most perfect spring day, bright, clear, warm, peaceful. All was right with the world, and Roberto and I had come back from the Farmers Market with flowers to plant. We walked into the back yard and found a good spot under a big pinon tree. One of the plastic pots of flowers I was holding slipped onto the ground with a small thud. I leaned down to pick it up, and as I did I heard movement in the tree above us. I looked up, anticipating a bird, maybe a cat, maybe a dead branch. Roberto looked up, too. In perfect unison we inhaled sharply. “Oh my God!” he exhaled. My first sounds were not intelligible. In the tree, moving horizontally, very fast was a huge, pink snake. It shot from one tree to the next, trying to escape my shrieks which had found words. The snake flew from limb to limb and finally landed on the ground a few yards away. By consensus, we later agreed, it had been at least 8 feet long, relatively thick, about 6 inches in diameter, and very, very pink, as pink as bubblegum. Back at the scene, it was now rising up off the ground four or five feet, like a cobra weaving and lunging at branches trying to escape. “It’s pink!” was all I could answer. As Roberto turned to get the shovel, it lowered itself to the ground, and slithered off out of sight. My mind was still reeling from this assault on my understanding of reality. It was pink, like bubblegum. Was it bubblegum? No, bubblegum doesn’t move by itself. It was pink like a newborn baby. Was it a baby? No, not in a tree. A newborn baby wouldn’t be in a tree. It was fast, and it was in a tree. It must be a bird? No, not with that long gyrating, pulsating, slithering body. Surely it was a snake, but why was it in a tree? Was I in Guatemala or Viet Nam? No, I was in my back yard. 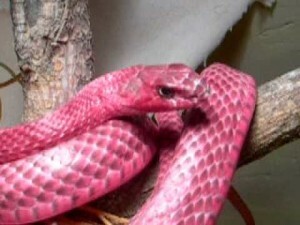 And, why was it pink, and with no snake marking, just solid pink. Was it a newborn baby snake, and then it would darken and get a pattern as it grew up? Grew up?! My God, if this was a baby, how big was the mother? And where was she? In the few seconds that we had to view this strangeness, my mind raced, like a computer at top speed, sorting data, eliminating possibilities, hitting brick walls, bouncing off them, trying again to find an answer that made sense. What was it? Where was I? Who was I? What was going to happen next? We looked for it, but it had vanished. Our neighbor Greg came over, fuel pump in hand. He had been working on his jeep and had heard my screams of “pink.” He was intrigued, and asked if we had been smoking something. We assured him not and we walked the perimeter of the yard, me keeping my eyes on the trees above us. When we were alone, Roberto and I shook and babbled. We both confessed to stark-raving terror, and we were so glad that we had both seen it. If either one of us had told the other, well…there would have been real concerns about sanity. He said he was glad it was gone before he got back with the shovel because he didn’t really want to chop its head off. And he admitted to the same reality computing problem I had had. In that instant, his artist’s mind leapt to the conclusion that the fabric of reality had ripped open in front of his eyes, and that he was seeing some strange pinkness, some new pink reality through the tear, and that maybe any moment Darth Vader or a dinosaur would appear in that pinkness. I told him about thinking it was a new born baby or a piece of bubble gum, and I saw a flash of concern in his face. “Oh, I’ll be fine,” he said, “I think I’ll go to Pinko’s — I mean Kinko’s!” And we both exploded with laughter, the kind that releases a flood of anxiety. That was years ago and there was never another siting of the pink snake. But I still find myself looking in the trees, just in case, and wondering why it came to us, in its amazing pinkness. I have learned that it has a name — coach whip — and that they are rumored to whip their prey to death. I now know that they can grow to over eight feet long, and that they find refuge in trees, and coil up and strike the enemy’s face repeatedly when threatened. And I understand that this is one of Mother Nature’s many creatures, and that she may not have intended to give me the jolt that she did. For awhile I was angry at her. Why did she single me out, and deliver me a shock on that lovely spring day that made me in an instant question all my knowledge about the world she had led me to believe in? Couldn’t she have given me a little warning, a rumbling of the ground, a darkening of the sky, a chilling of that innocent spring air? Well, I have not quite progressed to that point of view, but I am, sometimes, able to think quietly about the beauty of the snake, and ponder his little pink snake soul. And, if I were to see him again, I might apologize for disturbing his warm lazy day. The truth is that the pink snake and I have something in common. We are both creations of Mother Nature, and on that Saturday afternoon outside Santa Fe, we were both terrified out of our wits, or out of our skin, as the case may be. I’m glad Roberto didn’t chop its head off. After all, being pink is not a crime. Photo from internet. Color is right, size is small! I think, Lucy, this proves that “Mother Nature” is a crock. Father Nature for sure (and I suspect he is still laughing)! Ha! good one, Dale. But what about our complex discussion about gender roles a few blogs ago? we used to take beautiful little whip snakes to school in our pocket!). There were very few venomous ones (as there are in the Americas), and really all you have to worry about is the rattlesnakes where you life, which have those wide faces – and rattle if agitated. It would have been sad for you to have killed such a beautiful creature inadvertently, tho’ I well understand the nightmare kind of encounter you had. They’re very long, and very pink! The voice of reason and compassion! I appreciate you, Myv, and your upbringing in India never ceases to amaze me. I hadn’t thought of the snake aspect of it. You have a wonderful book in you, my friend. We called them red racers, they were always so swift. And definitely possessed of spiritual intensity. Ah, no, my friend. A red racer is a different kind, and puny at that. Plus they are red not PINK! Just couldn’t resist bringing the story back to life….glad it gave you a fright! Lucy! That is a terrifying, horrifying, hilarious story!!! Egads, I’m sure I would have had a nervous breakdown right on the spot! I would have developed such intense startle response every time I walked under a tree! Thank-you so much for sharing such a great rendition of that fateful moment with the pink snake!! It’s been more than ten years and I still look up in the pinons whenever I go into the back yard no matter what time of year. Funny how a trauma can ingrain so deeply a habit like that… or maybe not so funny. Good for you, Margaret. I am envious. I have friends who welcome a snake siting, love to touch them, find them even cuddly. I just don’t think I could ever get there. But I would hope to be more broad-minded and accepting, and less judgmental! There’s a word for that kind of experience – ineffable. It’s what dream quests are made of. The key to growth is to transform them into strengthening experiences rather than into nightmares. Unfortunately, that key can be difficult to find. Hi Jonathan– I love this! Thank you. Something to aspire to, and clearly after all these years I am still working on the transformation and strengthening part of the experience. Writing helps. You’ve left me speechless. I guess I can find one word – WOW!! Lucy, did you see today’s New Mexican (June 1)? They had a picture of your snake! Yes!It was a terrifying picture and article. The thought of finding one in my house leads me to consider living in an igloo.